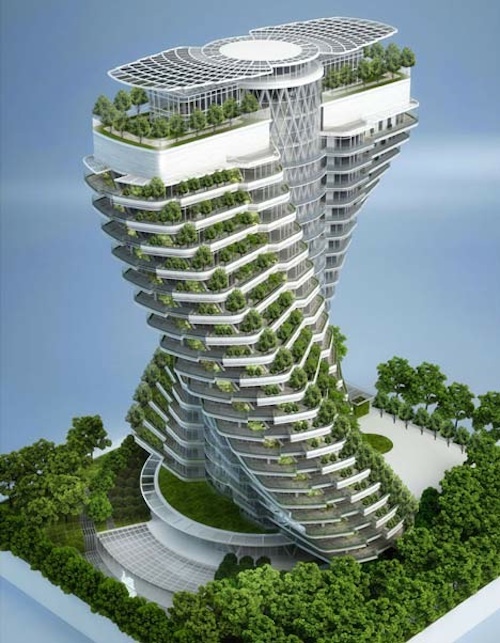 In the same way that a Sumerian ziggurat suggests a completely different culture, this apartment building by Vincent Callebaut suggests that a completely new culture could replace this civilization we know now, and become as normal as the one we inhabit. 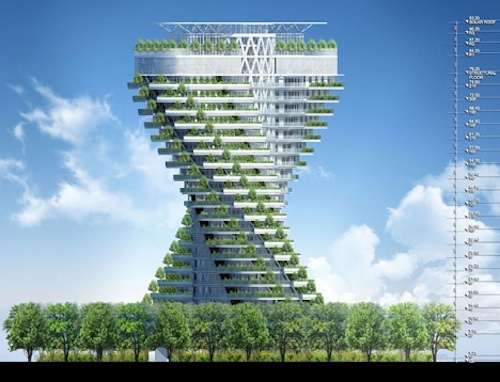 It’s not the first green apartment building in the world by a long shot, but this has an elegance and comfort with the concept that makes a future of green-integrated skyscrapers seem inevitable. Most “non-building-shaped” skyscrapers look like the self indulgent doodlings of bored architects. 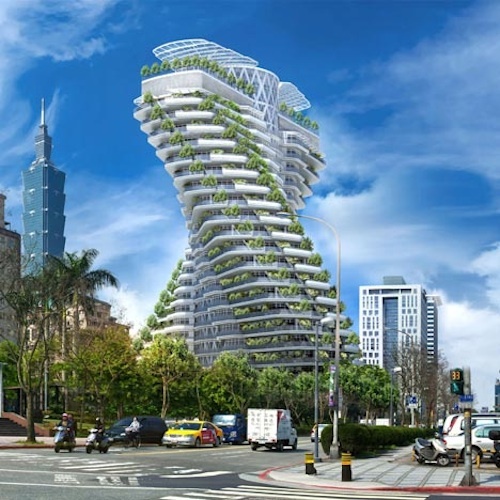 But this 20 storey apartment building in Taiwan, democratises the sunny side of the building. 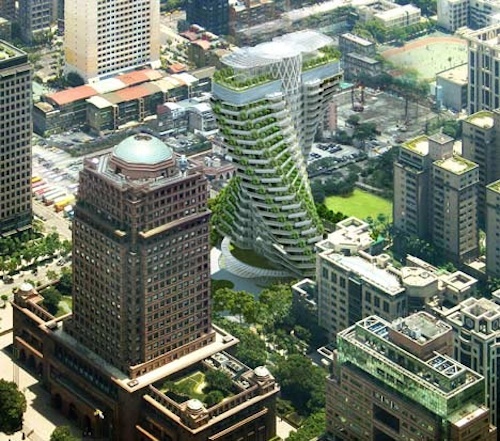 The Agora Garden is designed with a double-helix structure twisted up around a fixed central core. 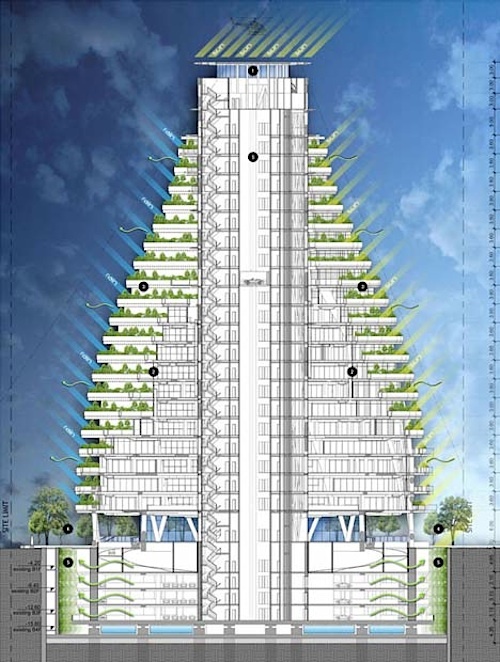 Unlike many skyscrapers in non ‘box’ shapes, this shape – a double helix with cantilevered levels – serves a purpose, by exposing the maximum possible greenery to the sunshine. 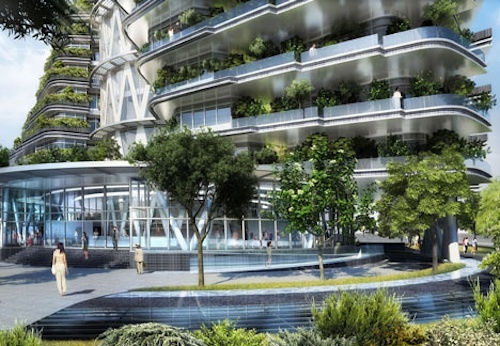 With its many vertically wide planted balconies, true suspended orchards, of organic vegetable gardens, aromatic gardens and other medicinal gardens, the building has the metabolism of a living organism. 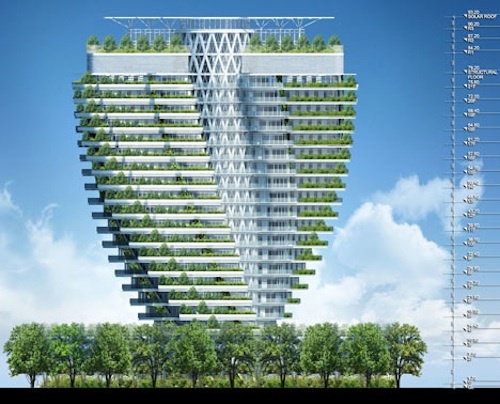 It will facilitate recycling of organic waste and rainwater reclamation. The natural cooling effect of all this transpiration is familiar to anyone who’s ever experienced the instant cooling effect of walking into a forest. The towers “revolving” geometry results in many different profiles from the point of view of the pedestrian in the surrounding streets. 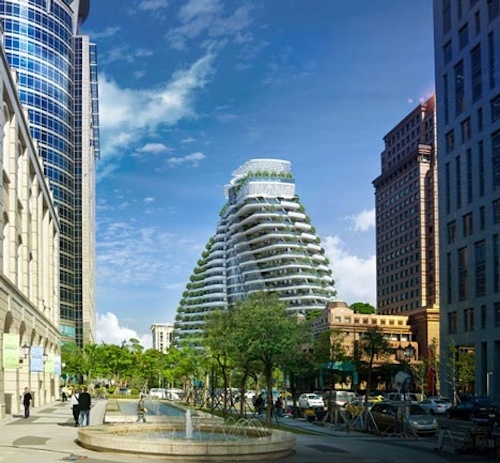 “The project represents a built ecosystem that repatriates the fauna and the flora in the heart of the city and generates a new box of subtropical biodiversity,” say the architects. 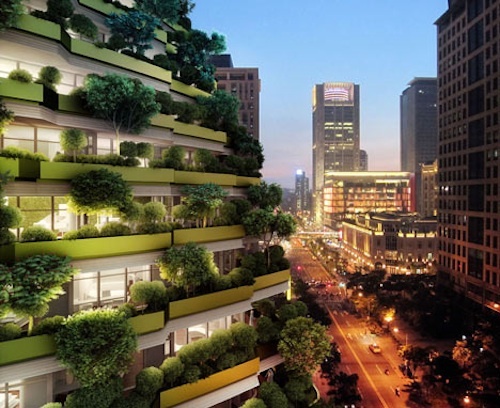 It is a new nest in the city of the future. This entry was posted on Wednesday, July 10th, 2013 by Susan Kraemer and is filed under Architecture. You can follow any responses to this entry through the RSS 2.0 feed. You can leave a comment.